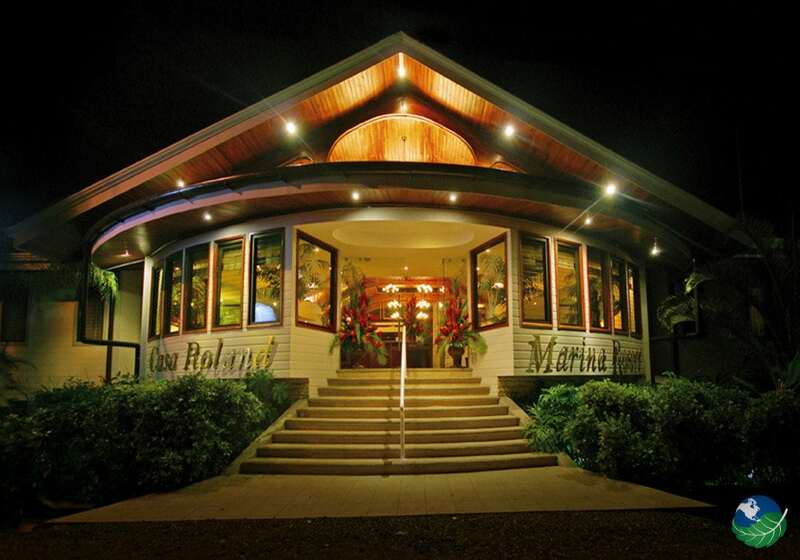 Casa Roland Golfito Marina Resort is located in the southern Puntarenas on the tranquil and mysterious waters of Golfo Dulce Costa Rica. Golfo Dulce is a tropical fjord beset by tall and green lowland tropical wet forests, steep hills and narrow plains. Also, this gulf is well-known by scuba divers and tourists looking to spot whales and dolphins swimming in its deep blue waters. Across the Golfo Dulce Sea inlet lies the port town of Puerto Jimenez. It’s the main hub for Corcovado tours and places nearby. Too, beaches in this area of Costa Rica are sought after for their remote beauty and vibrant wildlife all around. 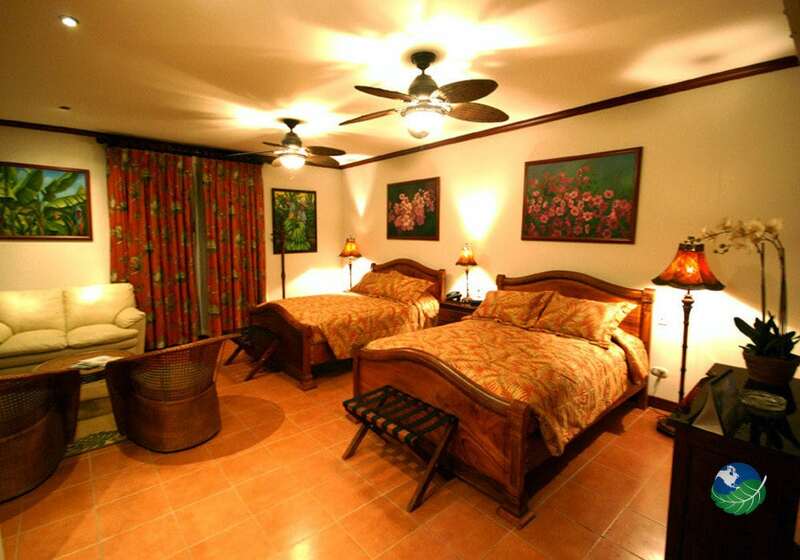 Rooms at this marina hotel in Golfito are charming. 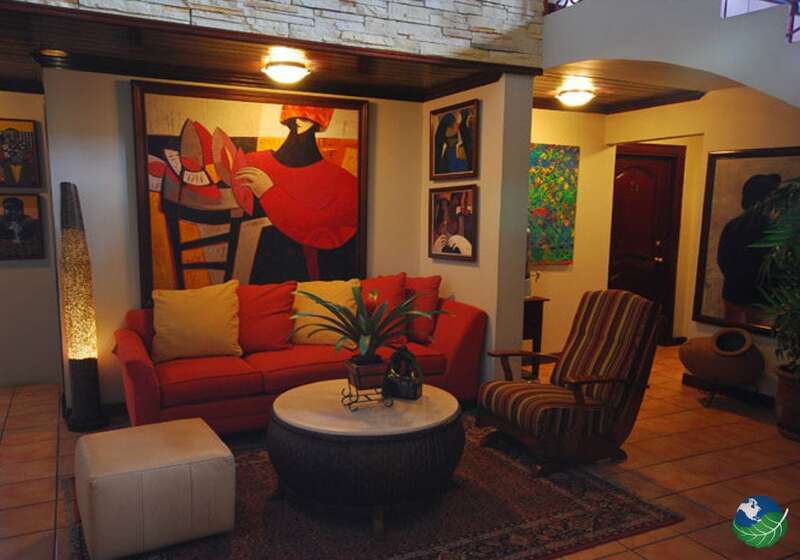 There styled with wood work and original art that put a spell on your senses. 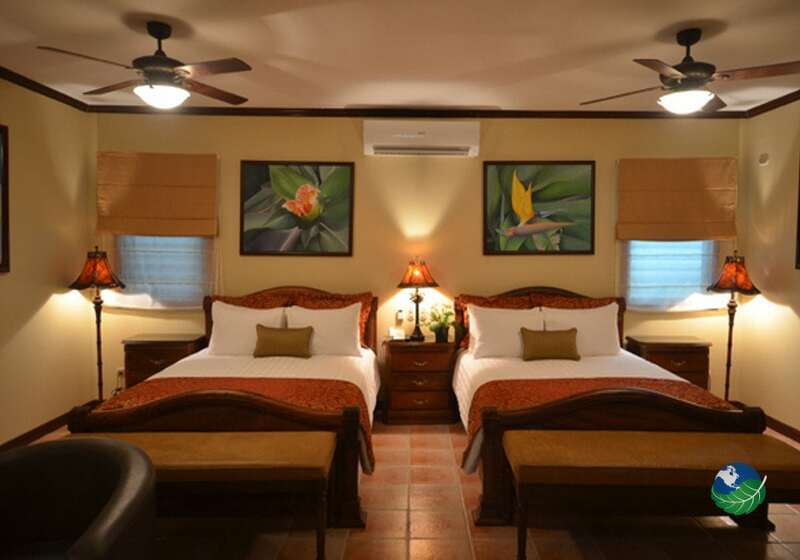 Guest suites at Casa Roland Marina Resort exceed what most lodgers expect them to be; they’re very cozy and have plenty of space. 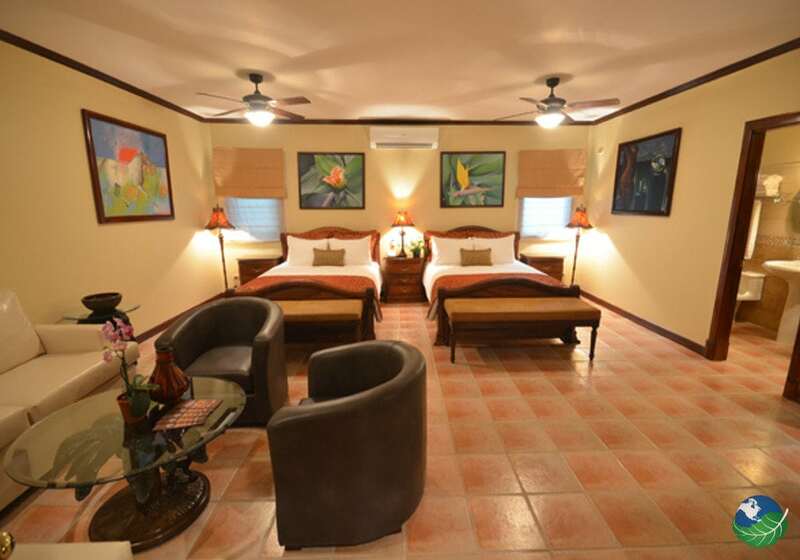 Every room has two queen size beds, two large flat screen tvs with cable, a balcony, a lounge and a bar area with a fridge. Unlike most south pacific hotels, this one has a conference center and an amphitheater catering to business groups, meetings, and events. 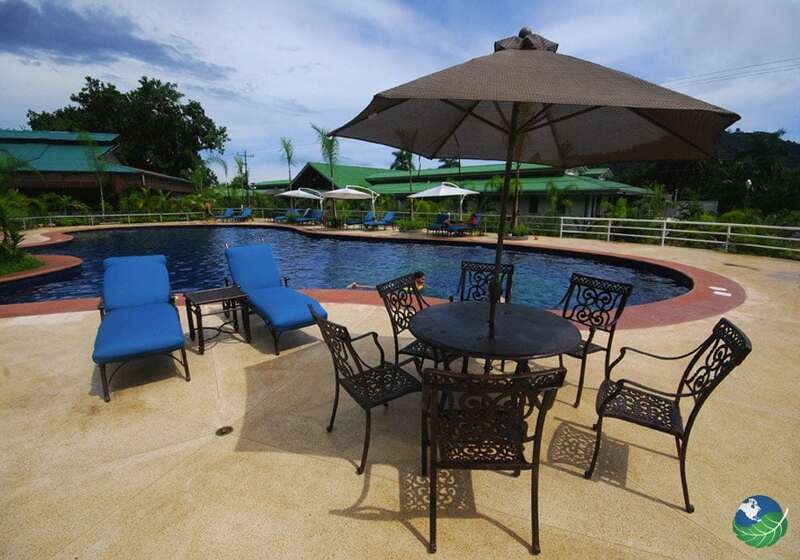 Patrons will also enjoy three pools; one used by children, one for teens and a swim-up bar at the pool that’s very liked by adults. 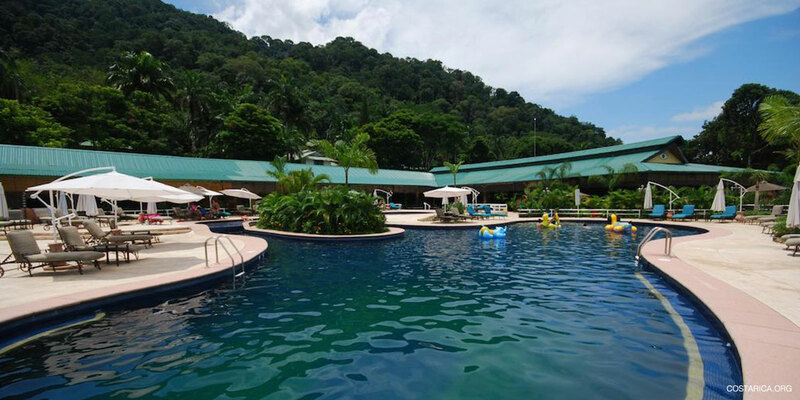 An ample number of eco activities can be arranged for your visit to Casa Roland Marina Resort and this part of Costa Rica. The south pacific coast has been blessed by mother nature with many jungle trails and waterfalls to explore. This side of Costa Rica has beaches for surfing; Pavones Beach down the coast has one of the longest left breaks in the world. Riverboats can take you through mangroves and estuaries where caimans, monkeys, littoral birds and wild animals thrive. Nature lovers should also visit the Golfito Wildlife Refuge for it is among the most biodiverse sites on the planet. They will happen upon awesome colors from macaws, parrots, dart frogs and butterflies living under the shade of giant trees. Blue Marlins, dorados, and other fish caught on a daily basis during sports fishing trips off the Golfo Dulce coast. Cruise ships dock near the town’s small marina where yachting and boating services are at hand for sailors. Other great tours in the area are kayaking, snorkeling and horseback riding. Golfo Dulce. Pool, Restaurant. TV, Phone, Safe Box. Concierge. Cabo Matapalo. Nature, Health & Wellness Spa, Pool. Laundry Service, Room Service.